One of the places we visit often with Cupcake is our local Lowe’s home improvement store. We’re lucky that our nearest home improvement store is very pet friendly. They even have signage right on their door about it. 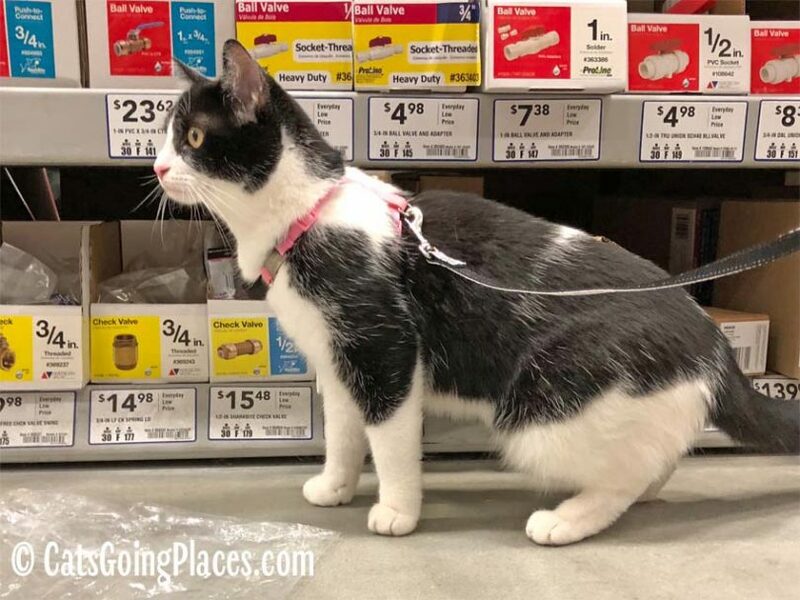 From what I’ve read, the Lowe’s chain went through a period a while back where they were less pet-friendly, and some stores still may not welcome well-behaved pets. As always, it’s always safest to check ahead of time. 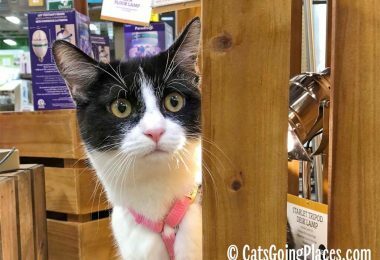 Perhaps because this is one of the stores we visit more frequently, Cupcake is pretty bold about exploring when we are there. On our most recent trip, after we picked up the bird seed we had stopped in for, we visited the covered garden center to see the furniture on end-of-summer clearance. Cupcake had never seen a hammock before, but she jumped right down from my arms to investigate it. She wasn’t very happy with how it moved under her, though. It wasn’t an adequate cat tree. There were lots of outdoor lounges and pillows on sale, too. 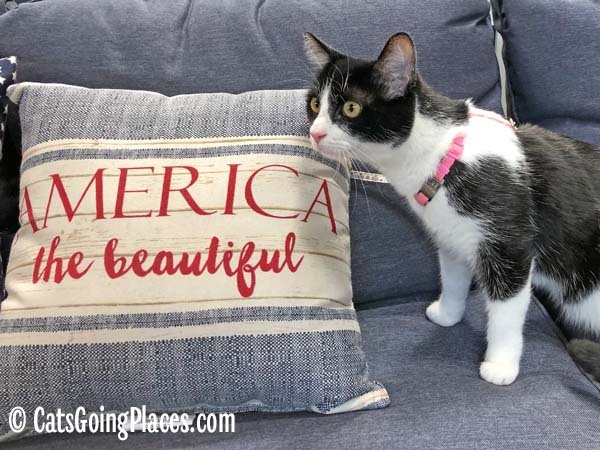 Cupcake paused to pose with this patriotic pillow that would have been perfect for last week’s celebrations. Sorry, Cup, we don’t need to decorate with that until next year. Sometimes we visit the garden center, especially when I need to do some planting in the yard. 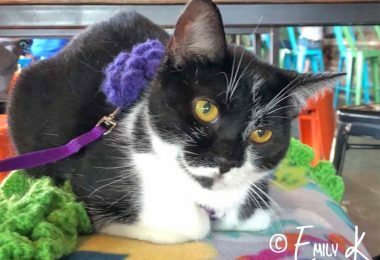 It is too hot for planting or for exploring the garden center right now. Instead, we headed back to plumbing, where Cupcake checked out the faucets. 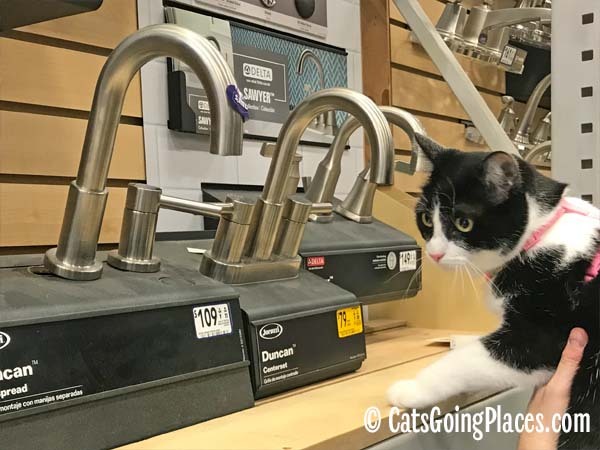 One of Cupcake’s favorite pastimes is watching water run from the tap, so seeing this many taps must have been very exciting. Unfortunately for her, this display was dry. I did promise to run the faucet for her when I got home so she wasn’t too disappointed. Another thing that fascinates Cupcake at Lowe’s is the appliance section. When we recently had to shop for a washer, she was very involved in the selection process, inspecting everything carefully. 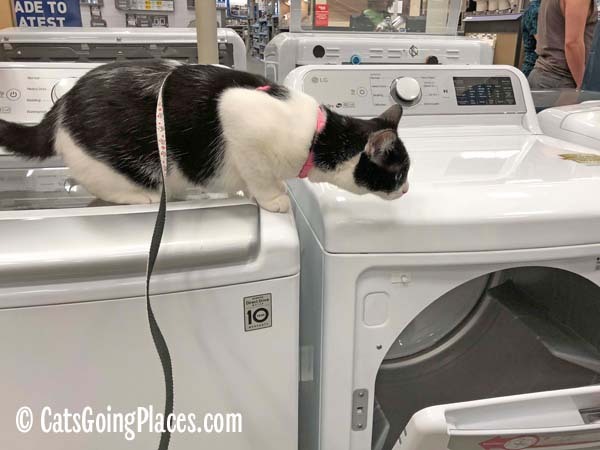 Our washer and dryer are in the cat-free zone of our garage, so these appliances may have been extra-interesting simply because she never saw anything like them. 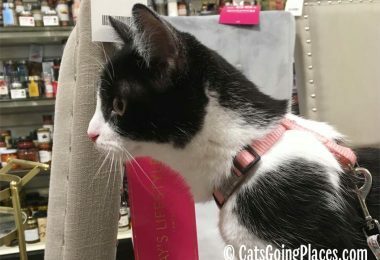 Surprisingly, you don’t seem to get quicker service with sales people when you are shopping with a cat, so when it comes to buying big ticket items that require working with a sales associate, make sure your cat isn’t at the end of a long day of outings so she still has some patience left for the process. 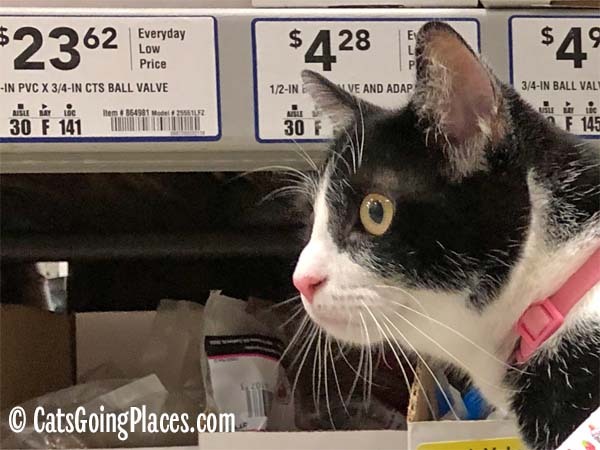 Cupcake likes to check out the floor-level bins along the aisles, like in the plumbing section, and I have to be careful she doesn’t try to explore behind them. Other things I have learned to be cautious of are the noises throughout a home improvement store. The key cutting and paint agitating machines both make loud noises, so I am extra-careful when we pass those desks that they aren’t about to start up their machinery. The end of the store that contains all the wood and roofing materials also tends to be noisier, since employees helpfully cut materials to length for customers. The carts for carrying oversized objects like wood tend to be much louder than standard shopping carts, and Cupcake can find them alarming, especially if she can’t see the source of the noise, so I try to make sure she can see them coming from a long way down the aisle, if possible. 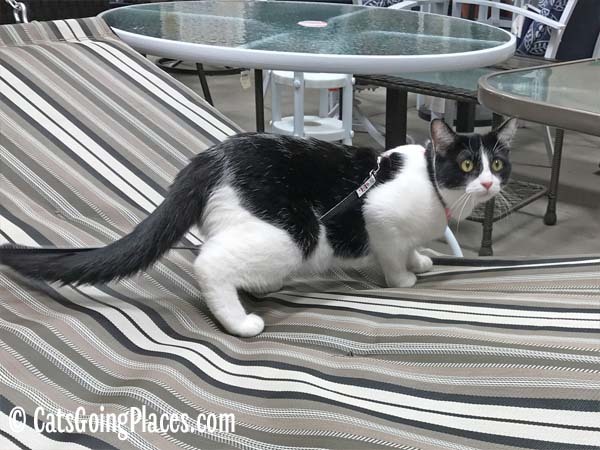 A visit to Lowe’s can be an enriching experience for your cat who goes places.  It’s a great way for you to do necessary errands while also spending some bonding time together doing something outside the house in a climate-controlled environment. It’s nice to have places to visit that are climate controlled during this heat. Our nearest Lowe’s isn’t that close – it’s over in Burbank. But I think it’s worth a trip just to see the washers and dryers! Ours are in the garage, where we’re not allowed too. I’m very envious. 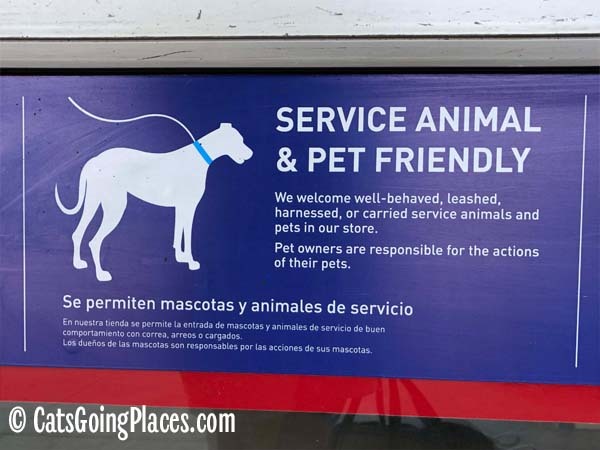 We don’t usually see those nice pet-friendly signs on stores. And when it has been so hot, I’d love to find a cool place to get off the boat with Honey. 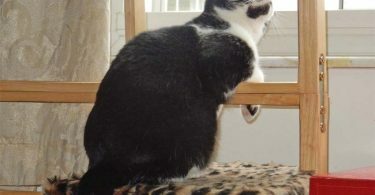 That said, it looks like a really enriching environment for Cupcake. Glad you have a good place to explore when it’s too hot to spend a lot of time outdoors. 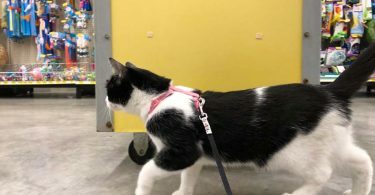 Sadly the Lowe’s near me is not pet friendly 🙁 A big loud store like that is a great place to train baby show cats to get used to space and noise so nothing phases them when they’re in the show hall.